The summer holiday of our childhood is bursting with the beach. An easterly blowing. The blue, flat and calm. The sand already blistering. White hot. We arrive when a car park in the shade of the Norfolks is easy to find. We leave before the sea breeze roughens the ocean’s surface. My mother is under a beach umbrella, expertly secured in the sand by my father. There she is, as if skewered to the beach in a one piece black and white polka dot swimming costume. A Big Floppy hat. The butter white muscles of her thighs portray her low energy and her equally spongy tummy a cause for chiding from my father. She barely goes in. Just a dip, to cool off. Never a stroke. Her hair stays dry; only the curls at the back of her neck are moistened by the salty water. Then back to the towel, the shade, the David Niven. My father swims. He lifts and throws us into the water. He lurks beneath us; a deep sea monster. His body garden-hard. We swim beneath him, through the arch of his legs. He carries us. All without sunscreen. Brown as nuts. Taut like children ought to be. Able to peel off skin like dried Clag glue. There is the endless digging of holes in sand. The collapsing of castles. The making of moats. Buckets of fan shells, as ordinary as snails, collected and taken home. Loved. Kept. Eventually thrown away as they become chipped and faded. The walk to the Holden is longer and hotter because of the shaded park. Accompanied by the slap slap of thongs. Shake the towels. No sand in the car. Blue vinyl seats are melting. A still damp towel is laid down to stop the scorching of bare thighs. Still skin sticks to car seats. Windows down. An ice-cream from the deli on the drive home. Mum – Hazelnut Roll, Dad – Peter’s Drumstick. Us – Giant Sandwich. Perfect for the child unable to bite into cold ice-cream. We rinse off under the hose on the back lawn. We must let it run cold first or else get burnt by the hot water that shoots from the soft as snake rubber. We let the run-off water douse the lawn. We strip off to reveal lobster white skin. Bathers are hung out to dry on the Hills Hoist ready for the next day, their lycra thinning to mesh. Someone is harassed to turn off the tap and stop wasting water. The day is too hot for bird song. Nothing moves. The chooks, open beaked, camp in the shade of the lemon tree. Gum leaves limply dangle. We have lunch on trays on laps while the cricket plays on the telly. Richie Benaud. 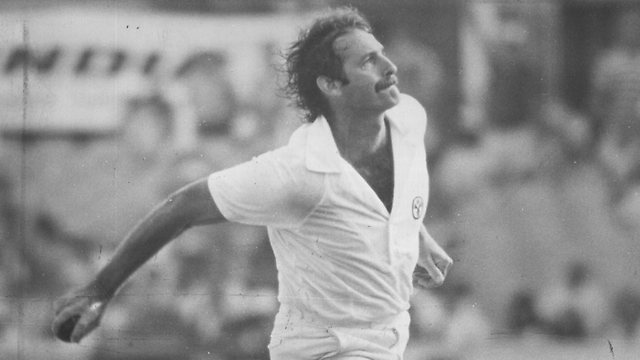 Caught Marsh bowled Lillee. Cricketers without helmets. Fielding in white toweling hats. Big Moustaches. A flair to their pants. The house is cool and dark. Corn fritters with tomato sauce. All the bamboo blinds are down on the outside. The whir of a fan inside. Too hot for outside. Lie on linoleum then. Shorty shorts and cotton tops. Lemon cordial with ice blocks. Never too hot for Dad. Always something to do in his garage or garden, whatever the weather. Despite Mum’s pleading to rest awhile and read his Day of The Jackal Christmas present. Gardening clothes on. Not seen again till tea time. Three females inside, watching Mum’s soaps or else drawing with textas and using the Husqvarna to make pot holders and place mats. Unjamming the bobbin of a wodge of twisted thread. Writing aerograms to grandparents overseas and sorting through postage stamps to put in the new album. This entry was posted in Memories and tagged 1970's, beach, childhood, cricket, summer. Bookmark the permalink.